With life comes an array of commitments, responsibilities, activities, and tasks, all of which serve to take up each and every hour of your day. Unfortunately, the day and week always seems to go by quicker than we’d like it to. If you’re like most other busy adults, you’ve no doubt thought many times how much you wish there were more hours in the day. Between work, family, friends, and activities you’d simply like to do for yourself, there just never seems to be enough time. If you ran a business or organization would you run it all alone? Chances are you’d hire help and delegate tasks out. So why should your home be any different? Life is chaotic and there’s no reason you have to try and handle the chaos on your own. Instead opt to delegate out some of those time-consuming household task and give yourself back some much-needed time. Save yourself some stress and outsource these six household chores. Depending on your wardrobe, dry cleaning is one way you may already be doing this. That being said, did you know you could outsource the rest of your laundry as well? Even if you’re like me, and find doing your laundry therapeutic, it’s a chore that is anything but quick. That’s especially the case if you have laundry to finish for multiple members of your household. Instead of spending hours each work washing, drying, and folding all yourself, outsource it. Many laundry mats and possibly cleaners will usually do all your laundry for you for a small fee. Think somewhere around $20-$30; a small price to use that time for other valuable tasks. The time it takes to give your home a proper and thorough cleaner almost equates to an entire day; a day you likely don’t have to spare. Even so, a dirty and unorganized home can just lead to more stress in your life. Hiring a cleaner to take your place can be a time and stress saver. Whether you hire someone to come every other week and spiff up the entire house or simply hire someone to take care of the bigger tasks like mopping, vacuuming, or dusting, that extra help can only benefit you in the long-run. As a homeowner, there’s an array of lawn and yard-associated tasks you need to complete on a regular basis, and if you have a snowy winter, would include shoveling as well. Again, if you go to a job everyday, the time to complete those tasks yourself is often limited and reserved for the weekend or the hours after work (if you’re really ambitious). Save that precious time for more useful activities and hire out your lawn care. Find someone to take on the jobs of mowing, fertilizing, and snow removal. The time you free up can be put towards the hobbies you enjoy, the things in life that help lead to a less stressful life. Inadvertently, you’d be surprised how a life of reduced stressed can save you in the end. While you likely enjoy dropping off and picking your kids up from school, depending on your schedule the times to do so can be inconvenient to say the least. Moreover, this is particularly true if said school isn’t close to your home or work, if multiple kids have to be picked up at the same time, or if each are involved in different outside activities. At the end of the day, it’s a daily activity that could have you running around town for at least an hour or two. Apart from the use of the school bus, hire a caregiver to transport your kids to and from school and activities. You’ll be able to keep focused and finish up projects at work or home with the hours saved. Thanks to the invention of Pinterest just about every homeowner has tried to complete a home project on their own at one time or another. Unfortunately, home projects and renovations are always more time consuming then they’re made out to be and in some cases more complicated as well. While you could try to do-it-yourself, hiring a professional to take the project off your hands will likely save you time and money. Not only will it possibly get done quicker, but it’ll give you back time to complete other tasks, like possibly even making more money at your side hustle. Whether you work full-time or have kiddos to take care of, finding the time to squeeze in a trip to the grocery store can feel impossible. Moreover, oftentimes, by the time you go to the store and make it home, the idea of cooking doesn’t usually sound like fun, which often means you spend more money opting for takeout. Take care of your grocery trip by opting to order your groceries online. Many stores now give you the ability to order online. Then you can either pick your groceries up or have them delivered. The risk of forgetting something will be a lot less. Plus, you’ll no longer have to take hour-long trips to the store. 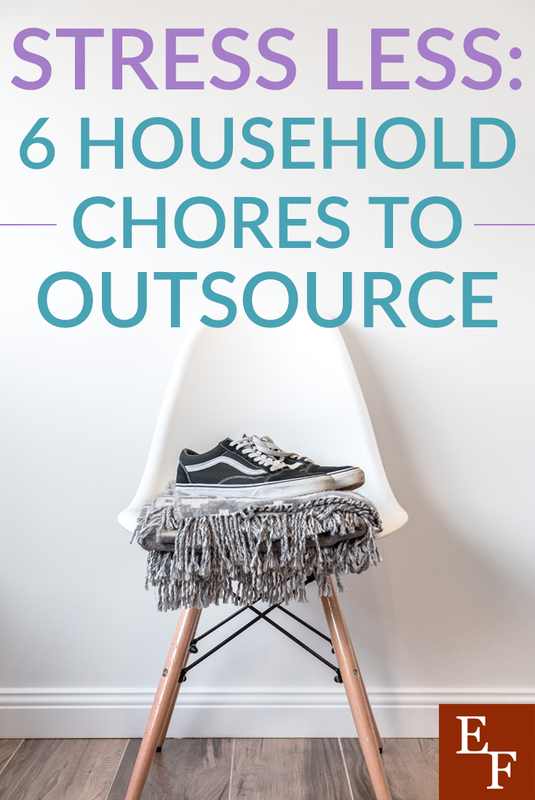 Outsourcing chores doesn’t have to be reserved for the wealthy or elite. In fact, many of said tasks don’t cost as much to have hired out as you’d think. Many weekly chores simply add up in time; time that many working, busy adults don’t necessarily have to spare. Gain back some of that time by delegating certain chores instead. In the long run, you’ll save money by being less stressed, since stress can often lead to pricey coping mechanisms. Plus, you’ll save money by freeing up time for you to earn money through side hustles or other means. Ultimately, there’ll be no greater feeling than simply having those hours back and finally feeling like you have just a little extra time in your day. Where do you go to find professionals to hire out some of your chores? If you did do this, what would you put that time towards? Why does it make sense to save over Christmas?